User Profiles let people see basic information about their teammates, and quickly get in touch with them. All profiles have shortcuts for text messaging, Push to Talk, and voice and video calling. Organizations can also configure custom properties that their members can see on each others’ profiles. What information can people see on someone’s profile? Each organization can specify the user properties that members see on each other’s profiles. These properties are fully customizable. Any property label and value can be displayed. You can even display lists, which are useful for showing things like certifications and skills. Organizations can also configure the order in which these properties are displayed on user profiles. In addition to custom properties, all user profiles show the user’s name, avatar photo, when they were last active on Zinc, and, visible only to people in the same organization, their email address. What is the benefit of adding custom properties to user profiles? It’s often helpful to get a little more information about coworkers you’re talking with. Knowing things like what department they belong to, what their job title is, what region they’re based in, or what their areas of expertise are can be useful for both finding the right person to talk with and asking the right questions when you need help. In addition, you can search for users by properties, and send broadcasts to them by properties. Finally, you can also segment your analytics by properties, giving you even more insights into what is going on in your organization. Who can see custom properties on a user profile? Custom properties on user profiles are only visible to other people in the same organization. Can users edit the information on their profiles? What about admins? No. Users cannot edit the custom information on their profiles. Likewise, Zinc admins cannot edit the information on user profiles for the users in their organization. The only way to change the information displayed in custom user properties is to change it in the system from which that information is synced to Zinc. How can I navigate to see someone’s profile? There are a few ways to access a Zinc user’s profile. You can find them in the People directory. On the info screen for a conversation, you can tap their name in the list of people participating in the conversation. Also, on the iOS and Android apps, you can search for someone and tap to see their profile. What type of data can I search on? Any user property value (in addition to first name, last name, and email address). How do the search results rank? Results are ranked by relevance based on the search query. In cases where many people have a given property and are equally relevant based on the query alone, they are ordered by their relevance to the person searching, based on conversation patterns. Where can I search by user property? 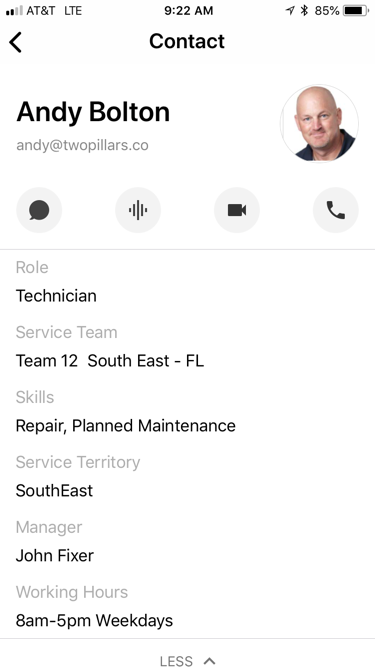 Both the “To” field in the message composer (when entering recipients), and, on mobile, the people and conversations search interface. How does user property information get into Zinc? The only way to get user property information entered into Zinc is via Zinc’s user sync API. The API is based on the SCIM protocol, which is a common way of synchronizing user data between cloud service providers. Many employee management and human resources systems can communicate with cloud services via SCIM. If you’re already using Zinc’s Active Directory sync capability, and the properties you want display on Zinc user profiles are stored in Active Directory, then adding the properties to your Zinc user profiles is very simple. How can I add custom properties to Zinc user profiles for my organization? Get in touch with us! We’ll be happy to help you get everything set up. In the meantime, you can learn more about nitty gritty details of setting up custom user properties here.